About Ella 6036BF5P-DLX1.0L-B Deluxe Barrier Free Roll In Shower Kit - 60" x 36"
The Ella Deluxe Barrier Free, Roll In Shower 60" x 36" (5 Piece) comes standard with a textured slip resistant Grip Sure™ floor, a collapsible white rubber dam which allows for easy wheelchair roll over into the shower stall and keeps water inside the shower, a choice of drain position (right, left or center), color selection (white, bone or biscuit), 2" chrome shower floor drain with friction seal, and Ella Elite White Accessories Package. Integrated 3 molded soap ledges on the back panel are an option to be specified on the purchase order. Ella Deluxe Roll In Shower Accessories Package includes beautiful Italian designed Ponte Giulio modern stainless steel soap holder, ergonomic hand shower slider and matching white vinyl coated shower rod with Kartri heavy weight shower curtain. Brushed stainless steel curtain rod, stainless steel straight grab bars 24" and two 36" and a four legged fold-up seat. Ella Deluxe Barrier Free Showers include German engineered Hansgrohe iBox, interchangeable pressure balance anti-scald shower valve, multifunctional hand shower, vinyl Techniflex shower hose and alternative wall hand shower mount for convenient hand shower placement. All come in matching chrome and metallic finish. Ella Deluxe Roll in Showers are manufactured using premium marine grade gel coat fiberglass which creates a smooth, beautiful, long lasting, anti-slip shower surface. 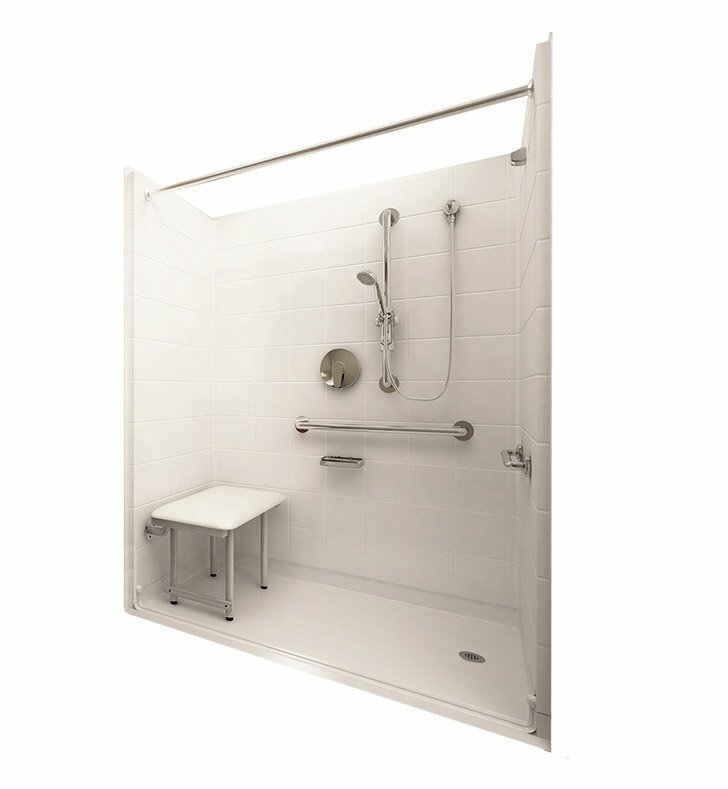 Ella Deluxe Roll In Showers also known as Barrier Free Showers, are constructed using wood and steel reinforced walls providing flexibility for seat and grab bar custom installation. The integral self-locking aluminum Pin and Slot System connects shower walls and the pre-leveled shower base to allow for easy front side installation. Once the multi-piece unit is assembled the precision fit seams become grout lines which can be nicely finished with caulk. 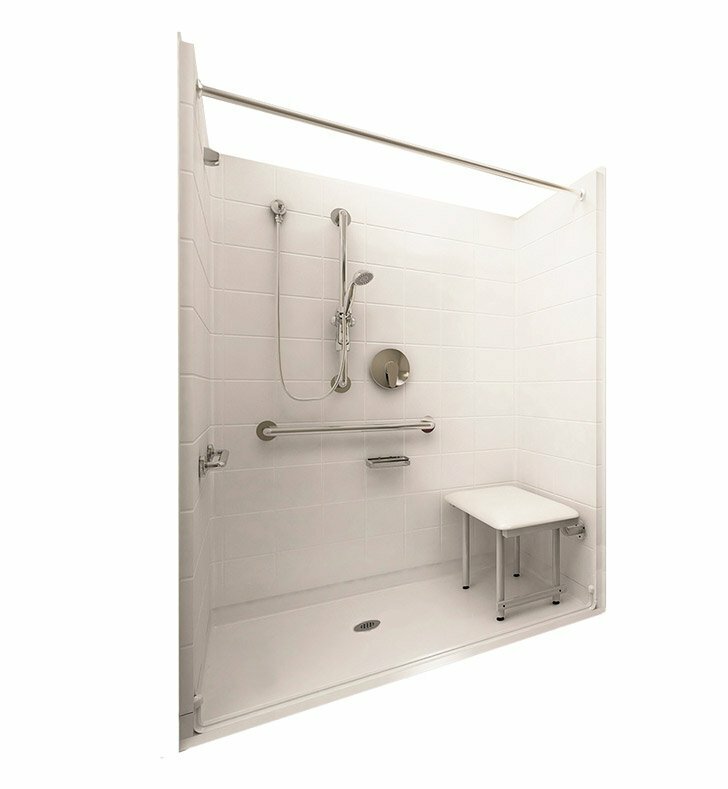 The no-threshold shower base is engineered to allow wheelchair entry without the need for recess or a ramp. The roll in beveled threshold is internally reinforced with stainless steel bars for added durability. The shower base is equipped with a factory engineered self-sustaining base, (mud-set not required) for proper water drainage and fast installation. Premium quality material, customizable placement of all shower fixtures, 30 Year Limited Warranty and ease of installation makes Ella Deluxe Roll In Showers ADA compatible and the best selection for your bathtub replacement or modification needs. *Change of Level Threshold has a manageable 1/4" vertical rise to easily coordinate with minimum finished flooring. **Due to panel material, sizes may vary. D 37" x W 60" x H 78"